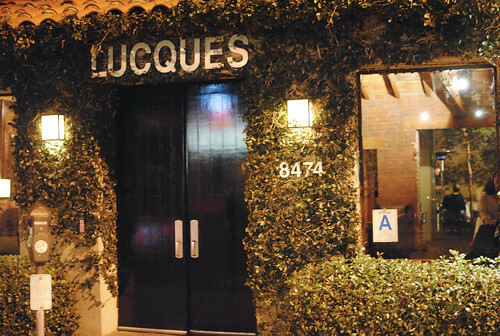 Lucques is Suzanne Goin’s first restaurant (opened in 1998), located in West Hollywood. The menu is seasonal and market-driven; every restaurant claims to be doing that nowadays but Goin was doing it before it become so cool. It’s probably attributable to her background at Chez Panisse, the landmark Berkeley restaurant focused on Californian market menus. 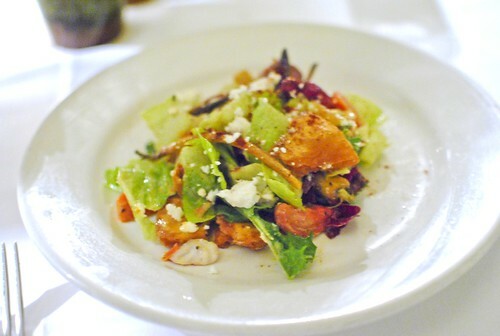 I’ve been to Lucques before a few years ago for DineLA. I don’t remember much; I remember it being fine/good but nothing particularly special. Coincidentally, DineLA was the impetus for this next visit: three appetizers, three entrees and three desserts were available to choose from, all from the regular menu. It turns out that it was actually the exact same menu and price as the “Sunday Suppers” the restaurant promotes every week. Two of us ordered the “fattoush” salad to mixed results – I went with the soup. Warm and comforting, the bean flavor was evident with some strong herbal notes. I liked the sweetness of the onions on top, as well as the melted cheese adding extra textural and savory flair. 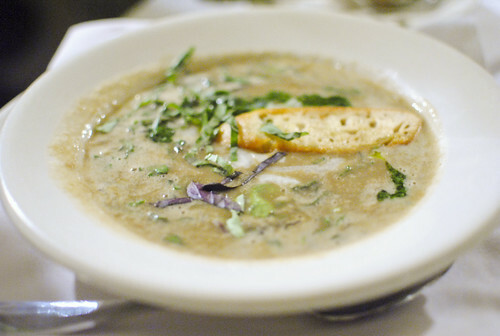 A thin crostini sat in the soup for more texture and body. The vegetarian at the table opted for this entree. 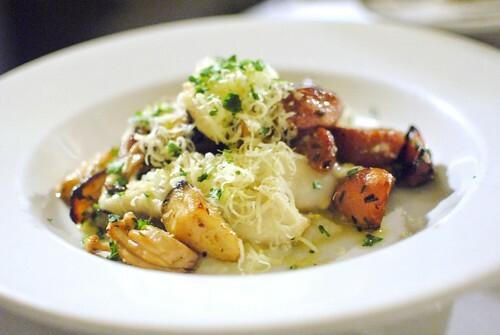 The dumplings were very light, fluffy and pillowy – pretty much like gnocchi. There was a creamy cheese flavor in the dumplings, accompanied by the bold earthy flavors of mushrooms in the sauce. Quite nice. The rest of us split between the steak and trout. I tried a piece of the steak and found it to be cooked well, tender and flavorful. 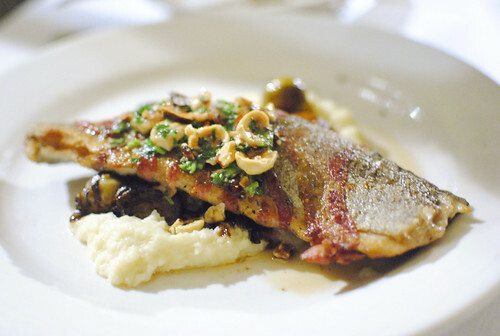 I thought the trout was more interesting, with a moist tender flesh and crispy skin. Oddly, I found the pork flavor of the pancetta to be missing though. There was a little bit of a sweetness in the sauce (I think from the reduced balsamic) that went well with the brussels sprouts, while some hazelnuts provided a nutty texture. 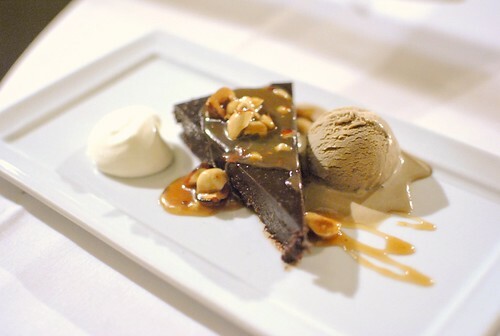 This was a fairly typical chocolate tart with a rich, bitter flavor (that I liked). Hazelnuts added texture and some nuttiness, while the coffee ice cream was quite good with a deep, strong coffee flavor. 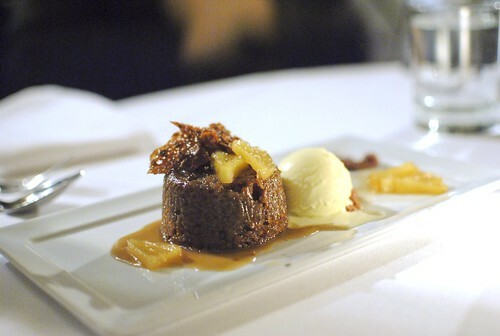 The pudding was actually a hearty pudding cake, warm and rather light. Pineapples added a different kind of sweetness, while some crunchy macadamias were the main textural component. Coconut ice cream was a nice accompaniment. Light and flaky, I really enjoyed the pastry of this tart. I missed the fennel and didn’t think there was enough salt in the salted caramel, but the caramel-vanilla-apple combination was still a tasty one. Some whipped creme fraiche was a nice touch. 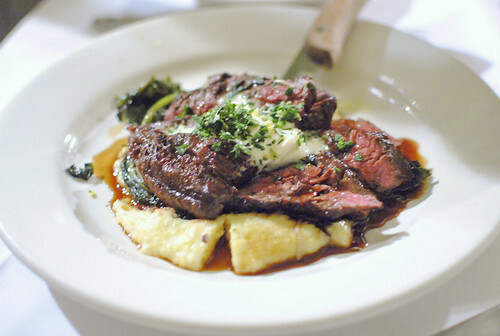 I had a good meal at Lucques – the food was comfortable and sort of homey. However, similar to my previous experience, there wasn’t anything particularly noteworthy about the food. I’m not sure if the DineLA menu was just more conservative (though all of the items we tried were on the regular menu), but I wanted something more, perhaps something less predictable. I wouldn’t object too strongly if someone suggested coming here, but I’m not in a hurry to return. The trout really looked good. I’ve never thought of cooking it with some panchetta. I might try and make a version of it. Sounds like a great idea doesn’t it? Even though the food isn’t groundbreaking stuff, it looks and feels so comforting and good. I look forward to trying Lucques sometime soon! A gift certificate doesn’t hurt too! Your photos keep getting better and better! You make the food look more noteworthy than it sounds like it tasted. 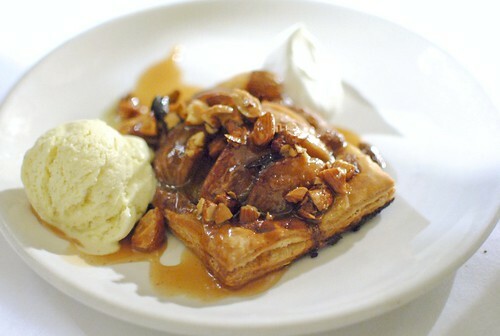 That said, I’m with Cathy – I’m craving some Lucques-style comfort after reading this post! Thanks Diana! You two should check it out soon!